You might think it's over-ambitious to look beyond high-definition when less than a million of the UK's TVs are currently plugged into a broadcast HD signal, but engineers at NHK in Japan are forging ahead on picture quality for the giant, cheap wall-sized displays we could all have in 2020. Visitors to the annual IBC 2008 broadcast technology exhibition in Amsterdam were treated to the world's first live link-up in Super Hi-Vision, from a camera atop City Hall in London. 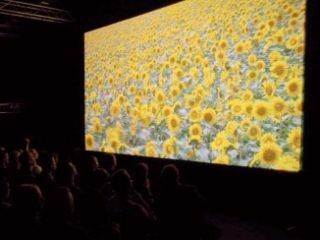 Also known as Ultra HD, the format is 7680 x 4320 (with 3 millions pixels), and on a six-metre screen it made regular 1080-line HD look a little flat. Erik Huggers, the BBC's head of research and innovation, talked live via fibre-optic link to former Tomorrow's World host Maggie Philbin at the Amsterdam RAI centre. The audience then saw the first-ever satellite transmission of Ultra HD, playing back from a server in Italy over Eutelsat satellites. Alex Lane, editor of What Satellite & Digital TV, was lucky enough to be invited to the demo. He said: "NHK and the BBC were pushing compression and transmission technology to its limits for this demonstration, but we could have been standing on the roof of City Hall with Erik looking across the Thames. "The journos at IBC are true broadcasting geeks, but everyone was impressed. I'm going to need a bigger wall." Super Hi-Vision in the home might be a decade away, but the BBC hopes to use it on giant public screens across the UK for the 2012 Olympic Games.